On Monday 23rd November 2015 the TRS Teachers sat down to an unusual All Hands Meeting (the six monthly get together, celebrate and plan the future meeting). It was the start of a year long journey to become a healthy business and complete the criteria in the Workplace Wellbeing Charter. The TRS staff were asked to fill in a questionnaire about their health and wellbeing. Answering questions such as approximately how much physical activity do you do in a week (a lot!) and do you feel stressed in your job role (yes!)? 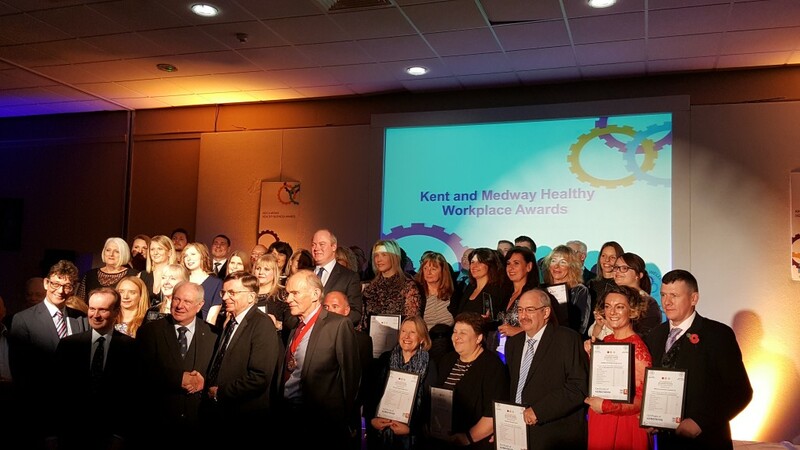 The Medway Council Healthy Business Team, who supported us throughout the process, put the information into their computer and we received a document that showed us where we could improve and what we were already doing well (notably celebrating our staff and their achievements). I got straight onto it. I gave the policies a huge overall and all of the TRS staff gave feedback and started to work with the new policy and procedure documents throughout their TRS classes. We had to implement Absence Management from scratch, we improved our Healthy Eating policy and we worked hard to put procedure in place for when TRS Teachers have to be away from work. I’m very proud of the policies now, they are much better than before and I feel they work for us and the people we work with. Stress was identified as an issue for TRS Teachers. Although they all agreed they love their jobs and that the stress isn’t down to the job itself, they felt they could do with some support. Many staff members felt the stress was due to putting pressure on themselves, it wasn’t actually an outside pressure and often wasn’t something that should worry them at all. I started to gather ideas for reducing stress and wrote the ‘Stress Free Freelancer’ blog posts. Bex, our volunteer administrator created a Health and Wellbeing Folder that’s available for all TRS staff and is full of information. We also had a stress focused All Hands Meeting in May and Steph, our Schools Dance Co-ordinator, shared some practical strategies to deal with stress. 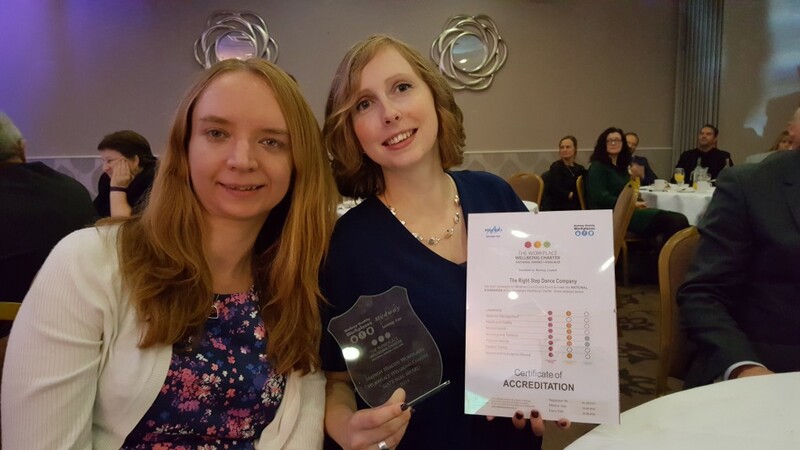 The Charter has three levels and we were aiming for the first, commitment, level as we are a very small business compared to some involved (entire councils and hospital trusts!). 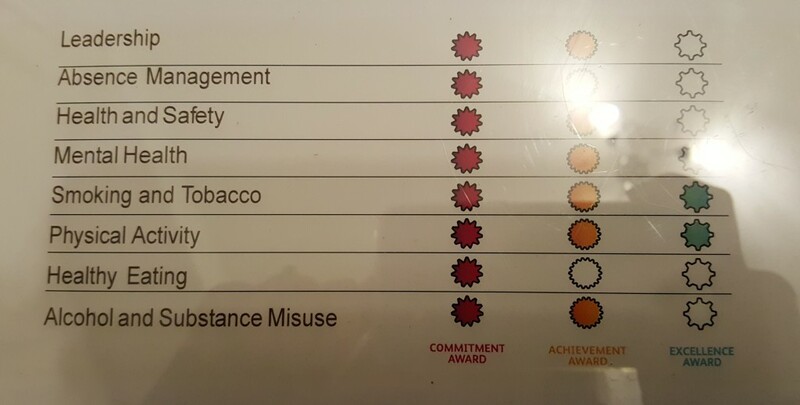 We were so pleased that by the end of the process we had gone much further than expected and have reached the second tier, achievement in almost all areas and even got to the third tier, excellence in two areas (smoking and physical activity). Perhaps we’ll be back to pick up an excellence award in a few year’s time!! A lmost a year on we had managed to get our evidence folder in order and it was presented to the Medway Healthy Business Team to check it through. Georgia, Steph and Bex were interviewed to check that we were actually doing as we said we were and we waited to see if we had reached our commitment goal! 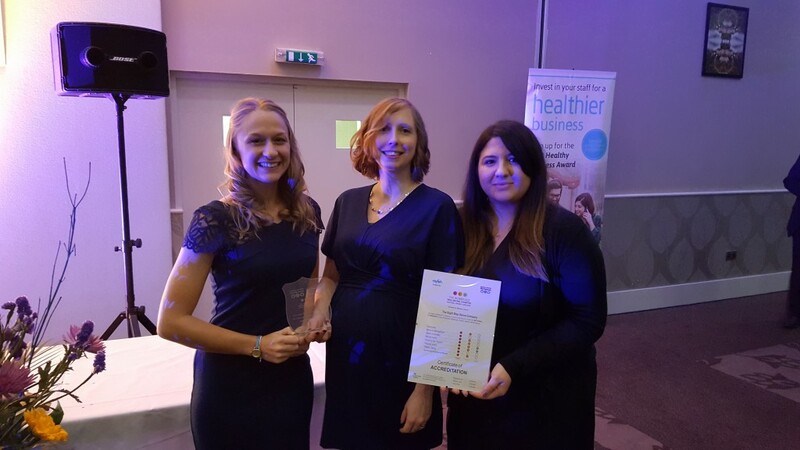 On Thursday 17th November 2016 (almost a year since we started the process), Georgia, Steph and I attended the Healthy Business Awards and had a fantastic evening. 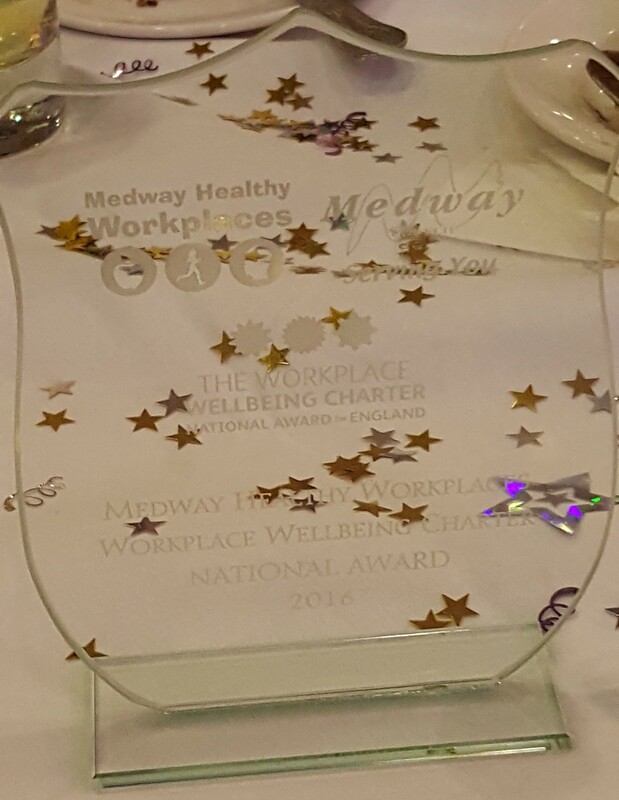 Businesses were from Kent as well as Medway and there was a lot of great work to celebrate. We heard of potato competitions, an office dog that staff can take for a walk around the block instead of going for a smoke and a group of staff from one firm who have turned their lives around and now run for charity. I would like to thank Michelle Saunders from Medway Council, who helped us throughout the process and all of the TRS staff members for their support and patience. It can’t be easy when you’re given new policy and procedure documents to follow (there was a lot to read!). I do hope they’ve felt a positive affect as a result of this process and I look forward to continuing to develop the company with our wonderful staff in mind. For now though, let’s celebrate with our brand new trophy! !